Say it on your ring - forever! This custom made-to-order sterling ring or band is a great gift - for yourself or someone else. 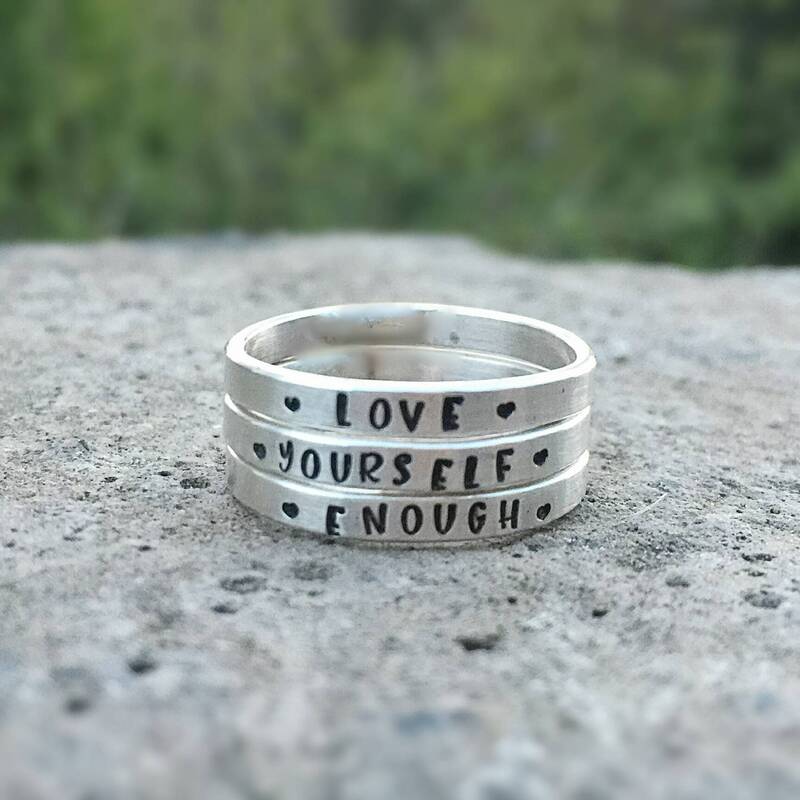 Makes a great little dainty yet sturdy posey ring, by itself, or wonderfully stackable! Available in Matte, Shiny, or Antiqued finish. Price Depends on NUMBER OF rings. Buy several for a stacked look, like in the photos, or just one, for a dainty look. This is available in sizes 4-15. It is approximately 2mm wide by 1mm thick. It is available in several of our tiny fonts - you may choose from the drop down menu. YES - we can engrave the inside rather than the outside of the ring if you desire, BUT, it is either/or unless its just a few letters. 4. Let me know the SIZE of your ring. Don't worry - if there is any issue at all with your choices, we will contact you for further direction before we finish the piece. ♥ Most retail items ship within about 1-2 weeks from order date. Need it sooner? Just ask. Often I can accommodate! Every single piece is sawn, hammered, pierced, filed, oxidized, buffed, and finished by hand - right here. We take great pride in our work, and even though our processes might be a bit slower, they are time-honored with classic proven quality. If you want the best hand-hewn look, you have come to the rithanplace.